Outfit the entire Fire Department with their own Personalized Fire Department Coffee Mugs. Great Personalized Gifts all of the men & women in the fire station will love. Our Custom Firefighter Coffee Mug is Dishwasher safe and holds 11 oz. Includes FREE Personalization! 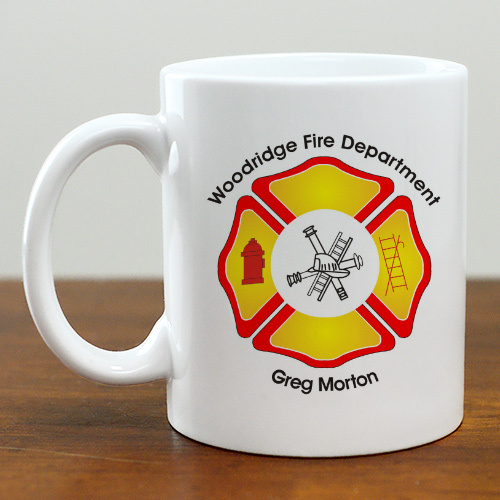 Personalize your Fire Department Coffee Mug with any one line custom message and any name. Ordering was very easy. Very fast delivery. GiftsForYouNow.com has many additional Personalized Gifts for your special gift giving needs. A Personalized Firefighter Gift is perfect for Dad, Uncle or Grandpa on Father's Day, his birthday or even Christmas.